The overwhelming popularity of HD camcorders drives high-definition files like MTS, M2TS in an unprecedented universality. However, none of the HD MTS or M2TS video can be imported to iTunes directly due to format incompatibility. So if you feel like to put these footage in MTS/M2TS from HD camcorder to iTunes for sync to your Apple devices, to convert MTS/M2TS to MP4, MOV or any other iTunes readable formats is a must have. Prior to the detailed steps of how to transcode these HD video files to iTunes, let's have a look of MTS and M2TS files and benefits by the conversion. MTS and M2TS are both file extensions for HD digital video camera recorder format - AVCHD. Both of the two formats support 1080i and 720p in a relatively small file size, in full HD standard 1920*1080/1440*1080 for resolution. However, there is a slight difference between MTS and M2TS. In brief, MTS is the extension used in legacy file systems and comes from an AVCHD camcorder while M2TS is applied in more modern ones and is from proper Blu-ray. 1. Make a permanent backup of your camcorder MTS/M2TS videos into the iTunes library, so that you can save your favorite footages in your iTunes library and sync to Apple devices easily. 2. By converting camcorder video to MP4, MOV, M4V and transferring to iTunes, you can edit these home-made videos with iMovie or Final Cut Pro, thus making Hollywood-style movies for sharing with your friends. 3. Play MTS/M2TS videos on Mac or sync your AVCHD videos to iPhone, iPad, iPod with iTunes for playback on the go. Now that you know the simple way to resolve the format issue is to convert these camcorder HD AVCHD videos to iTunes, so a professional M2TS to iTunes converter is needed to accomplish the task. Here MacX Video Converter Pro is introduced to help you. It acts the best HD video converter for Mac that is able to convert any HD videos like AVCHD MTS M2TS MKV to iTunes, iPhone, iPad, Apple TV, Android with high quality and 16x faster speed. Free download this ultimate MTS M2TS video converter for Mac and run this software, import M2TS or MTS source video by clicking "Add File" button. You can also add more than one video files and convert them at one time. To convert MTS M2TS to iTunes on Mac, simply hit Apple Device -> to iTunes. 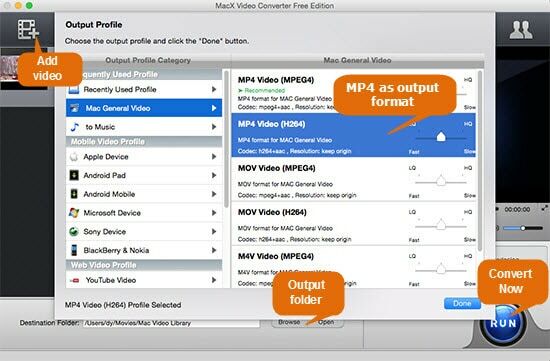 BTW, besides MTS/M2TS video conversion on Mac, you can also convert AVI to MP4, MKV to AVI, VOB to MP4, WMV to H.264 etc. on Macbook Pro/Air, iMac etc. Tips: this MTS/M2TS video converter for Mac features excellent video editing, letting you trim video to get favorite segment, crop clips to change the aspect ratio between 4:3 and 16:9 to better fit your iPhone, iPad, iPod, merges several MTS/M2TS files into a new one. You can even add watermark to personalize your videos and plug in subtitle to your video before conversion. Hit the "RUN" button to start converting MTS M2TS video to iTunes on Mac OS. Then you can sync MTS/M2TS files to iPhone, iPad, iPod with iTunes. For Windows users, please go to video converter for Windows version to do the MTS/M2TS to iTunes conversion. MacX Video Converter Pro is an excellent AVCHD MTS video converter for Mac to easily and fast convert MTS M2TS to MP4, MOV or any other iTunes acceptable video formats with high quality for limitelessly playback on Macbook Pro/Air, iPhone 8, iPad Pro/Mini 4 etc.